If you sometimes need the versatility of four-doors, but don't mind sacrificing some interior accommodations in exchange for a stylish exterior that is super-car chic, the CC may be the right choice for you. If you sometimes need to carry more than four passengers, have tall kids or require the added space afforded by a folding rear seat (the CC has only a small pass-through), the Volkswagen Passat may be a better choice. The 2011 Volkswagen CC sees changes to its standard and optional equipment list, creating a more streamlined ordering experience. The Sport trim loses its fog lights, while the leather seating option is removed from all 2.0Ts. The Dynaudio system is now only available on the VR6, which also gains heated and ventilated front seats. Rear side thorax airbags and the two-tone beige leather interior are no longer offered. The 2011 Volkswagen CC's interior is, in a word, gorgeous. Although the dash and console are typical VW fare, it's the distinctive seat sew pattern and elegant door panels that draw one in. Ribbed stitching on the seats, a choice of solid or perforated leather (leatherette is standard on all 2.0T trims) and a rear seat split in two by a roll-top center console and folding ski pass-through comprise the most striking design elements. Front seat passenger will feel completely comfortable, but rear passengers measuring six-foot or better will find headroom is anything but plentiful. The C-pillars also have such a prominent inward slant that our rear passengers reported them uncomfortably close to their head. Volkswagen calls the CC a "coupe" - despite its four doors and four-passenger capacity - because of its coupe-like profile and sharply tapered rear C-pillar. Although based on the Passat platform, the CC sits lower to the ground and is both longer and wider than the Passat; it is a handsome design that can definitely turns heads. Unique to the CC are its frameless doors (the window glass has no frame surrounding it), a feature that, with age, can sometimes lead to wind and moisture intrusion. Upper-end models are fitted with Bi-Xenon HID headlamps, while all models include standard alloy wheels. 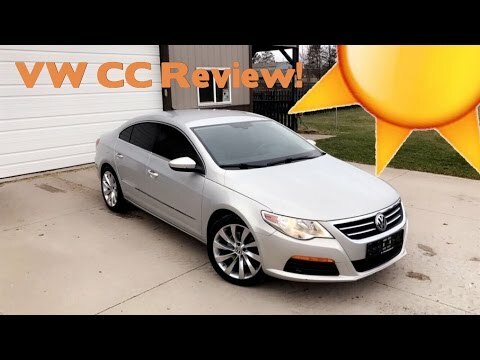 The 2011 VW CC is a wonderful driver's car. The steering is precise without too much assist, the suspension strikes just the right balance between comfort and performance handling and the interior sound levels at speed are remarkably minimal. The standard six-speed manual seems in character with this sporty sedan, but it's the Direct Shift Gearbox (DSG) automatic available only with the 2.0-liter turbo that really makes this car a delight to drive. For the money, the 200-horsepower turbocharged engine has plenty of power to move the CC, and its fuel economy figures rival some compact cars. Moving into the VR6 brings more low-end torque for faster starts and passing, but the six-speed Tiptronic automatic's slower response time just doesn't inspire the kind of fun-to-drive playfulness found with the DSG automatic. The 2011 Volkswagen CC Sport has a Manufacturer's Suggested Retail Price (MSRP) starting around $29,000, while the Lux trim jumps to nearly $32,000 and the Lux Limited to around $35,000. A fully-loaded 4MOTION VR6 tops out around $42,000. Prices consumers are actually paying may vary throughout the year, so be sure to check our Fair Purchase Price to see what others in your area have paid for their CCs. As for resale, we expect the CC to hold strong five-year residual values, with the four-cylinder models outperforming the VR6 trims. Overall, the CC is predicted to hold resale values better than the Hyundai Azera and Chrysler 300, but below the Acura TL, Buick Regal, Nissan Maxima and Lexus ES 350. The base 2011 VW CC Sport features a 2.0-liter turbocharged engine and six-speed manual transmission. Standard equipment include 12-way power adjustable driver's seat with four-way power lumbar support, heated front seats, AM/FM stereo with MP3-compatible six-disc CD changer and auxiliary input, SIRIUS Satellite Radio, iPod integration cable, Bluetooth, automatic headlamps, heated side mirrors, tilt/telescopic steering wheel with audio controls and 17-inch alloy wheels. The Lux trim adds fog lights and navigation, Lux Plus gains a rearview camera and panoramic sunroof, while the Lux Limited adds Adaptive Bi-Xenon headlamps and 18-inch wheels. The VR6 adds a six-speed Tiptronic automatic transmission, 4MOTION all-wheel drive, leather seating surfaces, heated and ventilated front seats, power rear sunshade, dual-zone climate control, Park Distance Control and the 600-watt Dynaudio sound system. Standard safety equipment on all models includes front side and full-length side-curtain airbags, electronic traction and stability control and four-wheel anti-lock disc brakes (ABS). Options for the Volkswagen CC are pared down to just a few packages and dealer-installed options. The Sport can be equipped with a six-speed Direct Shift Gearbox (DSG) automatic transmission (standard on Lux trims), and fog lights (part of the R-Line Package.) Stand alone options include larger wheels, chrome exhaust tips and a ground effects kit. Employing two clutches, one holding gears 1, 3 and 5, the other assigned to 2, 4 and 6, the DSG automatic can make instantaneous gear changes allowing it to outperform even the best manual (and its operator). Seat comfort is paramount to long drives and the CC's 12-way power adjustable heated and ventilated driver's seat with four-way power lumbar support is among the best in the business. 2011 VW CC owners have a tough choice on their hands. The Sport and Luxury trims are outfitted with Volkswagen's award-winning 2.0-liter turbocharged four-cylinder engine, while the VR6 4MOTION has the equally legendary 3.6-liter VR6 six-cylinder powerplant. With 200 horsepower, the 2.0-liter turbo provides plenty of go power with no sign of turbo lag or annoying vibration. The VR6, on the other hand, offers 80 more horsepower and a big boost in torque, making it well suited for the extra weight added to the 4MOTION setup. Based on the popular Passat platform, the 2011 Volkswagen CC "four-door" coupe casts off the stoic styling of its older brother, adding a sporty yet elegant feel to a functional four-door sedan. Unlike the Passat, the CC can still be had with a choice of four or six-cylinder engines, a manual or automatic transmission and front or 4MOTION all-wheel-drive. Of course, traditional sedan buyers probably won't be happy with the un-sedan like rear seat accommodations, lack of a folding rear seat and four-passenger seating, but, as Billy Crystal once mused, "sometimes, darling, it's better to look good than to feel good." Bearing more than just a passing resemblance to the ultra-luxurious, ultra-expensive Mercedes-Benz CLS, the 2011 Volkswagen CC plays more in the same league as the Nissan Maxima, Acura TL and Buick Regal. Black Volkswagen cc luxury car. The car was sold to us with faulty manufacturing so we had to put in a lawsuit for it. Every week once we fixed one thing another thing seemed to break on the car. After months of repairs we finally got it to run smoothly with no more issues. Now that its fixed it's a great car. Good spacing, great sound system, nice interior and exterior design. Volkswagen. The beauty that is a beast. I love the look of v. W and its features. It is my 2nd one the 1st was an eos. It was beautiful but a total lemon. V. W gave me a huge break on cc to appease me. But at only 70 thousand miles it is having problems. V. W. Is fun pretty and innovated but not a reliable product. Will never purchase again. That it is actually pretty room inside and it fits lager build people with relative comfort. I like the look and the rareness of the car. There are not many CC's in the area so not over saturated like a Jetta. The car has sleek style and is very roomy for tall people inside. It has a lot of recall notices so that is annoying.